Texas recognizes three types of wills. Oral, handwritten and typewritten wills are all valid in the state. Texas Probate Code includes the state’s requirements for wills and includes detailed instructions on creating basic documents. You may prepare a will in Texas if you are at least 18 years old,or if you are under 18 but lawfully married or a member of the military. Write or Type "Last Will and Testament" at the top of a sheet of paper or in a word processing program. Add your name, address and the date. Then declare that you are of sound mind and body. Compile a list of your next of kin, the surviving members of your family or anyone else you would like to receive your property at your death. Create an inventory list of all of your assets, including your financial assets and all types of property. Decide how you want your property to be disseminated among your survivors. Write or type instructions on allocating your property. Decide, along with your spouse or partner, how you want your minor or disabled children to be taken care of after your death. Create a guardianship arrangement that includes options for care in the event that both parents die at the same time. Choose a person to be the executor. This is the person who carries out the instructions in your will. Always check with the executor to ensure she is willing to take on the task. You may also choose to add another executor should the first person named be unable to perform the task or precede in death. Select at least two people who are at least 14 years old to be witnesses for your will. Sign the will and ask your witnesses to sign. Write a self-proving affidavit for your will as mandated by Texas Probate Code, Section 59 for handwritten and typewritten wills. The code includes a template for an affidavit. Copy the wording of the template and fill in the blanks left for your county, the date, your name and the names of your witnesses, in the presence of a notary public. Assemble two witnesses to listen to you state your oral will if your property is valued at $30 or less. If your property is valued at more than $30, assemble at least three witnesses. State the conditions of your will in the presence of your witnesses and designate who will receive your personal property. Create a written record of your will within six days of making the will, unless it is made during your last illness and at your home. 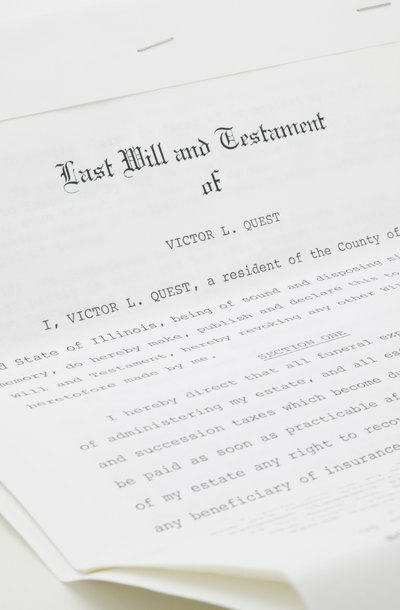 A will that has not been committed to writing within six days cannot be probated more than six months after death, so it will be as though you died intestate. Planning your estate may involve creating several documents to address your end-of-life care before you die and your property after you die. Two of these documents may be a will and living will. A will directs the distribution of your assets after you die and a living will directs your health care while you are alive. In Pennsylvania, any person over 18 years old who is mentally fit can make a will. The Pennsylvania Consolidated Statutes set forth the provisions for the creation of legally binding wills in the state. Hiring the services of an attorney can help you navigate the state’s will requirements. However, you can also write a will on your own at no cost by carefully following the state guidelines. Is a Handwritten Will Legal in Washington State? In Washington State, a handwritten will is legal but all of the requirements under state law must be met.